Peter Carey has won two Booker prizes: the first for Oscar and Lucinda, which was made into a movie starring Ralph Fiennes and Cate Blanchett; the second for The True History of the Kelly Gang, which sold two-million copies worldwide. 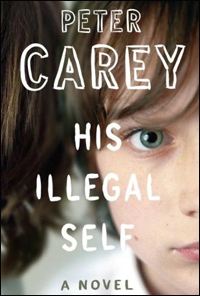 Now he has published his tenth novel, His Illegal Self, which tells the story of a seven-year-old whose parents are in the Weather Underground. I spoke with him in Los Angeles. Jon Wiener: In His Illegal Self, the year is 1972 and the characters are set in motion by the Weather Underground. I’m reluctant to talk about the plot because one of the pleasures of the book, especially at the beginning, is figuring out the plot, told mostly from the perspective of an seven-year-old boy. Could you explain what you want people to know about it? Peter Carey: This is the number one issue for me at the moment. I spent two years building this book, which really depends on withholding information. It delivers a whole series of surprises and thrills for the reader, I hope, which was not easy to achieve. But we live in a culture where people confuse story and art, and where reviewers are called upon by their editors to report the story. So while they are praising this book, they are sort of destroying it by giving away all these things.